There are good anniversaries and ones that feel… ummm… well, not so good. Holly and I wanted to write a little something for those that might be in the same boat as we—the “man-that-day-really-stinks boat.” We said goodbye to James and Scott on August 1, 2000. And ever since, that day hasn’t been the same. We’ve traveled to many a place, sharing our story, and we’ve met many others that have their own day—those no-good-rotten days that linger on the calendar, staring us in the face, begging us to crumble under the pain they symbolize. Four years ago, on this particular day, I was nine months prego, and had this amazing moment with God. My no-good-rotten day had actually snuck up on me. That was a first for me! On top of that, some of my good friends were throwing me a baby shower to celebrate Zachariah’s soon arrival. I had agreed to this?! What was I thinking? (a.k.a. baby brain) This all occurred to me on my fifth trip to the bathroom that night. (a.k.a. baby kicking bladder) So all of a sudden I sat there, wide-eyed, in shock that I had not been dreading the day. In fact, I was planning to celebrate on this day! Woah! Talk about God’s redemption at work. As my head pressed against my pillow, in the wee hours of an August 1st morning, I started running through my usual pattern of “anniversary” thought. I recalled what I had done that morning in 2000. I cringed again about the argument James and I had before he left the house. I remembered watching the clock for his return so that I could apologize. I thought about how I went to bed that night not knowing that he was already holding the hand of Jesus… his faith had been made sight. I recalled the waiting, the watching, the bargaining with God, and the “whys.” I remembered the moment when our worst fears were made reality as over 24 hours later we received the news that there had been an accident. All these memories were running through my mind on that morning four years ago as I curled up underneath my covers. All this remembering created a very odd feeling in me, to be honest. I sat there going through the fatal turn of events, just like I always seemed to do on that day, yet at the same time, my heart’s voice whispered, “Lord, is it okay that I’m remembering?” As quickly as I had uttered those words, another memory transported me to my past. I was on a hillside. I could almost feel the stillness of that dark night as I stood questioning God. Etched into my being, alone before the King of Kings, I came to understand comfort that is not of this world. A broken and desperate widow experienced God’s nearness that proved He indeed loved this seemingly insignificant human being. He spoke over my life in my darkest hours. Grace upon grace. “God, I’m remembering… is that okay?” You see, I was conflicted. I almost felt guilty about reminiscing. A few inches to my right was my husband Dallas. I could hear him inhaling and exhaling. I couldn’t be more thankful for the gift God had given me in his companionship. And then to my left was a monitor that hummed with sounds from my son Noah’s room. “Lord, You have never left my side. Your plans are completely beyond my wildest imaginations!” I said, as I ran my hand back and forth on my round abdomen that cradled Zachariah. “Lord, Is it okay that I’m remembering?” Sometimes you can’t help but sound like a broken record. God spoke into my August 1sts and wanted me to know that not only should I remember; but I need to understand that He remembers. He remembers those moments even clearer than I do. As I close my eyes and mentally walk the roads of my past, I dare not miss the moments He carried me… us. His otherness still leaves me speechless. And as I linger on each moment in time, He desperately wants me to understand that His love for me has never failed, that He is enough for ANYTHING that I would and will ever walk through, and that He is a God that doesn’t forget. And as I remember, I can rest in the truth that He remembers me… the gal that gets it wrong more than she gets it right. This heart wanders, only to be reminded that His cross is more than enough. You know I had thought Dallas and I chose Zachariah’s name… but we didn’t. He did. God picked it out and blessed me with the revelation that the sweet little smile I would come to know is actually a daily reminder that God remembers. It might sound odd, but I can’t stop thinking about Easter today. Easter is really the only thing that I can think of to compare to tough anniversaries. Good Friday: complex emotions over the death of one you love. Saturday: grieving, processing, holding out hope for the promises spoken about Sunday! We wait and hope—believing that LIFE will come from death! August 1 is not the end to our story… or James’ or Scott’s. It’s part of the story, but the story is SO much bigger than that! There are places in me, and maybe you, that beg us to get stuck in our Fridays. We mourn. We don’t move on. We can’t look forward. We get stuck in the pain, trapped in the sorrow of Friday. But we can’t miss out on Saturday! I know Sunday’s the BIG day, but a lot can happen in us on Saturday. It’s a testing of faith—of living out what we believe—of hoping that indeed Sunday will come! We cling to the promise that He will come for us! There will be an end to our suffering, the injustice, the tears, and the horrific news stories! Sunday will be AH-MAZ-ING! But we can’t miss living anchored to hope while we endure Saturday. 1. Remember your Friday. Don’t fight the desire to remember or “busy” yourself in an effort to ignore this natural response to loss and disappointment. If we strive to disengage our heart, we miss moments of growth. So go ahead: remember, talk about it, re-live moments. BUT… don’t get stuck in your “Friday.” At some point, you stop looking back, and you set your eyes forward. 2. Make Saturday your Thanksgiving. You might think it would be a hard thing to do on a day that your heart is so heavy, but I promise thanksgiving is key. Whether it’s mental or you choose to sit down and put pen to paper, once you begin a list of thanksgiving, you may be surprised at how quickly you’ll see the presence of God even in the midst of your darkest day. Gratitude is good for the soul and it is healing to recognize, verbalize, and credit the hand of God. When we focus on our pain, we can get jaded and angry. Thanksgiving opens up our eyes to see life from an entirely new perspective. While you dwell in your Saturday, awaiting the promise of Sunday, build your faith by recognizing the blessings all around you. 1. Sometimes I cry, sometimes I don’t. Don’t feel bad either way. Most of the time I don’t and it surprises me, it might be because I’ve cried off and on the week that leads up to this day. My emotions are on !HIGH Alert! the entire month of July and then when I expect total meltdown, I have a peace that passes all MY understanding! He’s good like that. 2. Irritability. That’s just a nice way of saying that I can be a bit grouchy and easily angered leading up to my day. (Holly more so than me—just kidding!) Little things that shouldn’t be a big deal suddenly become a BIG DEAL! I call it “subconscious grieving.” I’m thankful for a God that understands our weaknesses and brings healing and freedom from even a July-hot-head. It’s been good for me to understand this “anniversary surprise” so I can fight against it. My sweet hubby and children have shown me much grace and love as they live with this sporadic “side-effect”. 3. You don’t have to hide. You might be surprised by this, but it’s okay to let others know that a painful anniversary is coming up. I’m not saying you need to post weird, mysterious, FB statuses, but I am saying call on a friend. Be vulnerable. I know you might say, “different strokes for different folks,” but the fact is God calls us to community. We need one another! Don’t wait for someone to magically “remember” your hard day. Invite someone in. Maybe it’s someone you know really well, or maybe it’s someone who “knows” what you’re going through because they’ve experienced something similar. I know this is a longer post than usual, but I hope that it encourages you on some level today… or on your no-good-rotten day! He can REDEEM your Friday! If you don’t know our whole story, here’s a link to the book, Dancing On My Ashes. OR Go here for to purchase the book! ← Dancing On My Ashes only $8! Your timing (and God’s) on this post could not be more perfect. 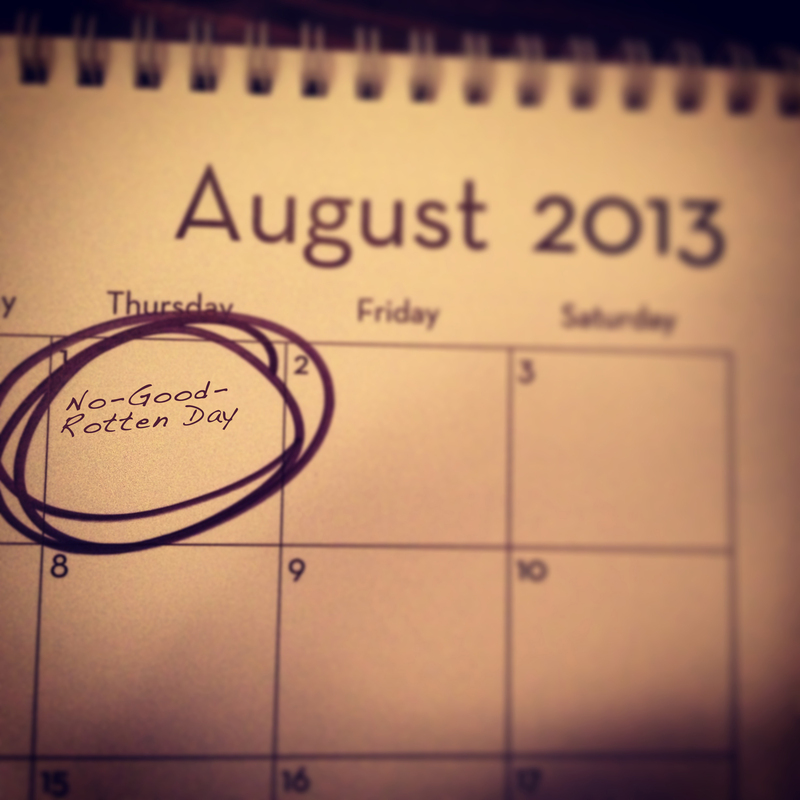 My no-good-rotten-day is tomorrow, Aug 2nd. It was that day in 2005 that I got the call (at work) that my Dad died very suddenly that morning. He just literally dropped dead. I miss him frequently, but every year when that date rolls around it is rough. Thank you so much for this post and your insights. Thank you for sharing with us regarding your no-good-rotten day… I just prayed for you this morning. God’s timing is indeed perfect! Your comment popped up first after I posted this, and the Lord used it throughout the day to encourage my heart that I had heard from Him and He indeed wanted to speak this message over many hearts. Hang on to Him with all you’ve got! Anyway, thanks again for your heart and sharing your healing process with others. Amber, I’m looking forward to reading your “remembrances”. Praying for you right now! Sunday is coming! Thank you for every Friday. And Saturday. And Sunday. Your comment made my day complete. You are cherished, Charles. Thank you for this post. I sometimes wonder if it’s okay to look back and remember the day(s) of great loss. Ironically, when I was 16, which was 13 years ago in my little girl fantasies I use to say that I would name my first born son Zechariah “YHWH has remembered” – I never made the correlation why that name meant so much to me until now. Though I don’t have kids, I still very much favor this name. Thank you for the comforting words. Our son Nathaniel died of cancer at the age of six. Before he was conceived I had a dream that I spoke to God and asked him for a son. I then was given the answer that I would have have a son but he would die before he turned 7 years old. Nathaniel’s name means given by God. I’m speechless, Linda. Your “Sunday” will be a glorious reunion! Thank you for sharing this with us. Lord, may Your perfect peace rush over Linda right now. Will You remind her that You are enough for this road of suffering she walks. Thank You for Nathaniel’s life… it’s hard to say it, but Lord, thank You for his death. Because even in death, life can spring forth! Bring LIFE from this, I humbly beg. Help us to see. Give us grace… and more grace. Amen.